"Thank you for sharing your lovely island, beautiful home and exceptional staff with our family. We had a wonderful time, and our vacation was truly unforgettable, thanks to you!" No need to worry about rain or running out of things to do. Mais Oui is amenity heaven ... something for everyone to do, no matter their age! 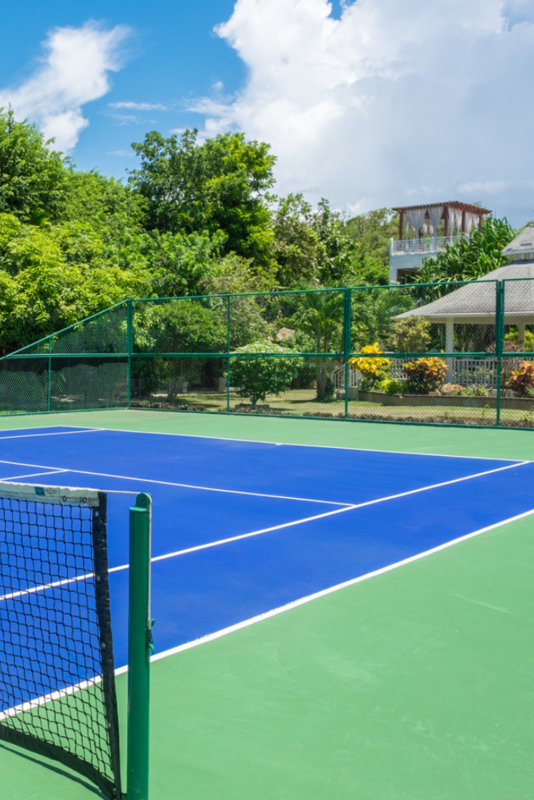 Tennis court for the exclusive use of guests at Mais Oui! Host your own mini-tournaments! Relax by the pool or soak in the hot tub . . .
No waiting for access to the pool or to snag a spot. No sharing the facility with people outside your group. Families and friends literally bond over this perennially favorite game! 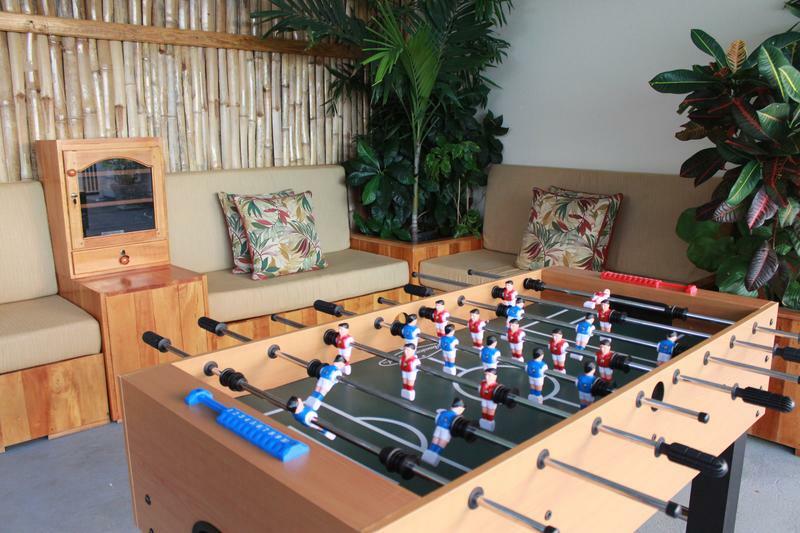 Play the grandest of strategy games on our roof top terrace with a cool drink and wonderful ocean views! Try to score a hole in one as you explore our grounds. Ours is the first of it's kind on the island! Beautiful seating space during the day turns into a theatrical experience at night for the whole group! 8 Unique bedrooms . . . Individually decorated, our bedrooms sleep up to 17. Accommodates groups of various sizes and configurations. Your villa experience is complete with cabanas among our fruit trees to create that "garden of relaxation" touch! 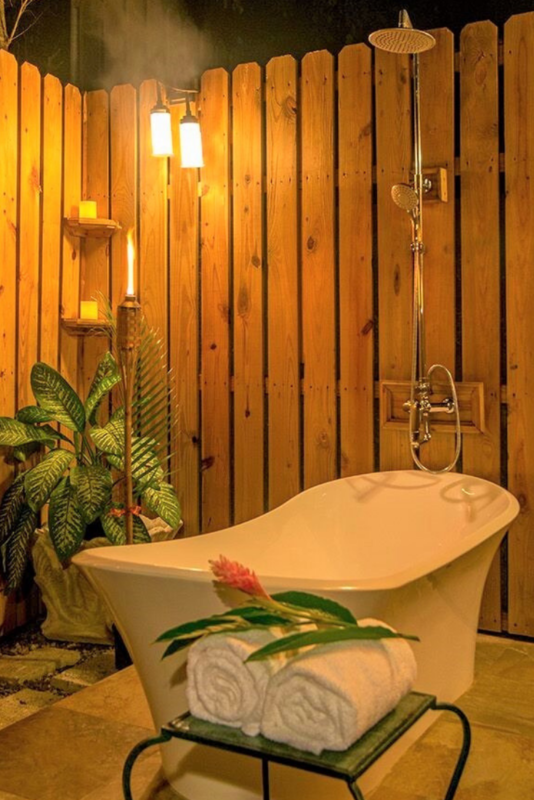 Your private on-site spa . . . 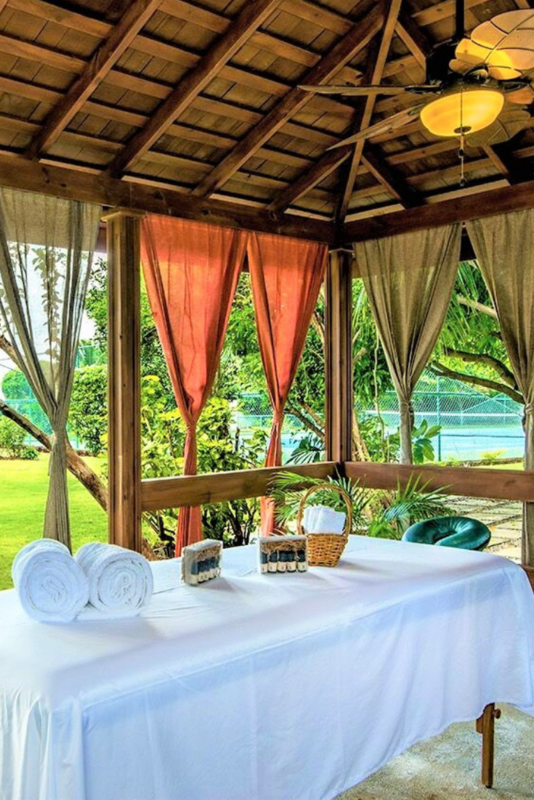 Relaxing or therapeutic, whatever your definition, spa services are the perfect complement to your villa vacation in Jamaica. Aromatherapy + hot stone massages = Bliss! Coolest outdoor spa experience ever! You simply must book a spa service. 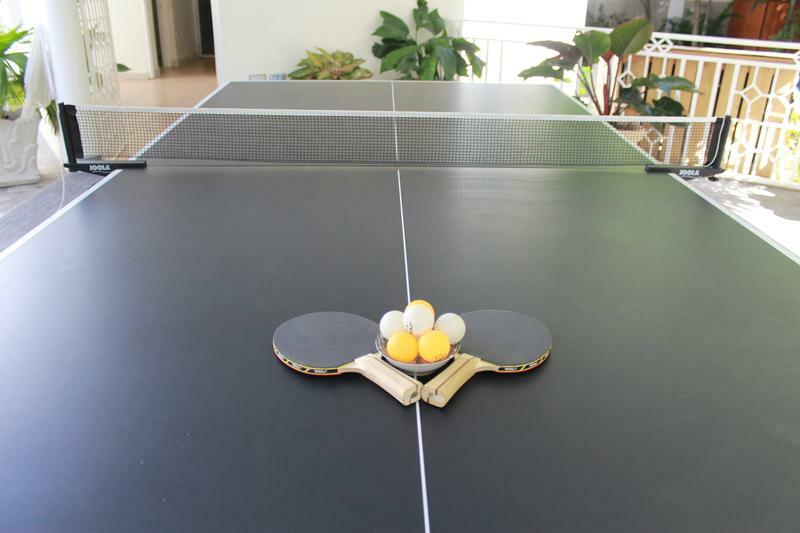 Challenge each other's skill with our ping pong table for your enjoyment! Available in our terrace billiard bar just for our guests. Want to kayak? No problem. We have 4 for you to use as well as life-vests. Stay fit in our gym . . . The food at the villa is so good you just might want to work off a few calories! roof top terrace … perfect for lounging, sun-bathing, dining, watching beautiful sunsets, star-gazing and many other surprises! Groups of up to 12 may eat in fine style in the formal dining room. Groups of up to 20 will enjoy a more casual flair in the indoor patio/bar area. The pool-side gazebo and the roof top terrace provide spectacular outdoor dining experiences and for special events. 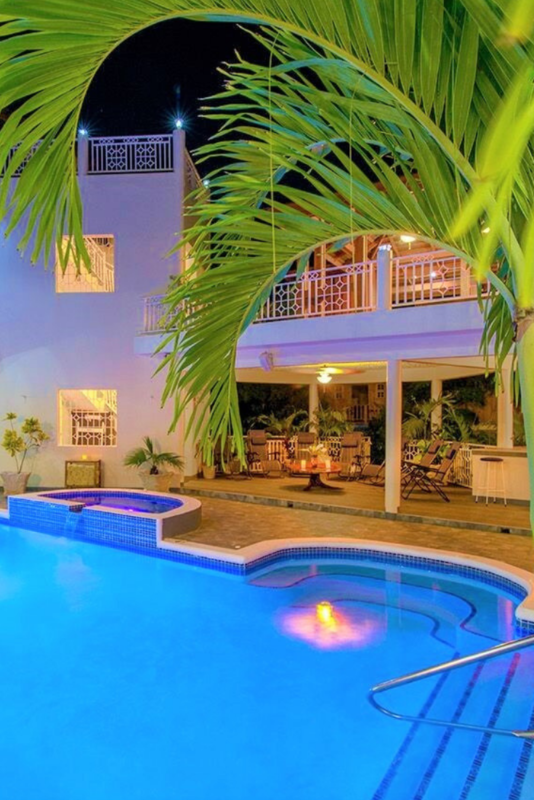 Mais Oui guests enjoy relaxation in a fully staffed, 8 bedroom villa. 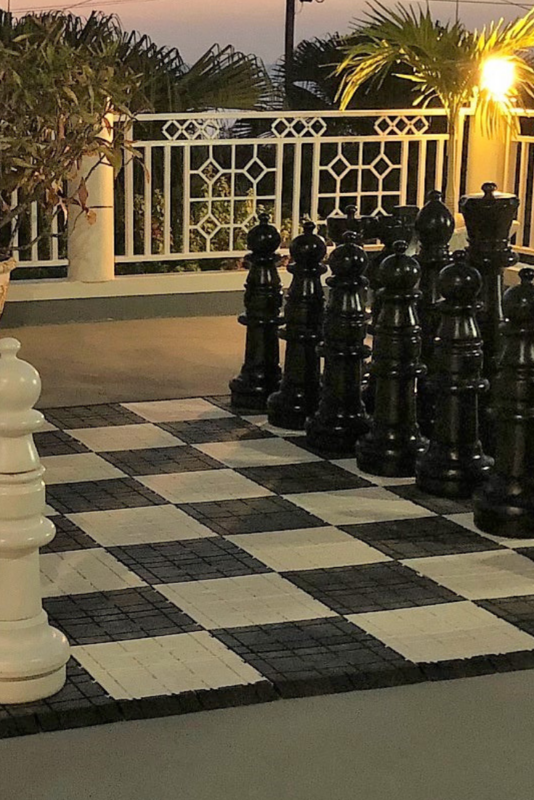 With plenty of on-site amenities and a central location from which to explore Jamaica's beautiful vistas and attractions, your vacation dreams become reality. One of our most frequent questions is, "How far is it to the beach?" Watch below for the answer!